HENDERSON, TX (KLTV) - Six months after an EF-2 tornado tore through Rusk County, one church is still weeks away from finishing repairs to its building. With tools and ladders scattered among hymnals and pews, South Main Church of Christ in Henderson looks more like a worksite than a house of worship right now. Crews are still about six weeks from completing work to the building's interior. In late May, the church was among 300 buildings in town damaged by the tornado. Pastor Bob Payne's home was untouched, but the roof of the church sustained heavy damage, allowing rainwater to pour inside. "My immediate thought is, where are we going to worship. Where are we going to put people? What are we going to do? Where are we going to have classes," Payne said. Since May, church members have been holding Sunday services in the fellowship hall, just feet away from the main sanctuary. Each week, Reverend Payne says he quotes the same scripture from the book of Ephesians, "Now unto him that is able to do exceeding abundantly above all that we ask or think, according to the power that worketh in us." It's a message of encouragement for church members, some of whom are still repairing damage to their own homes." "As individual Christians, we understand that it's God working through us. He uses our ability, but he helps us to get the job done." In the hours and days after the storm, Payne focused his efforts on prayer, asking the lord to lead his congregation to help others. "He says he will hear us. He will answer us. And actually, I can just tell you that things began right away to fall into the proper perspective." As they assessed the initial damage at the church, other members were busy in the community, helping neighbors in need. "That's the message of the Lord, is to take care of the things around you. And as we did that, we were able to see other areas that we could do things with." Payne says a sense of direction has energized his congregation, even leading some to return to their faith. "We're experiencing, even yet, an afterglow if you want to call it that, of our experience of depending on God to lead us through something." Even as a minister, he says he's amazed how this tragedy helped reveal the true power of prayer. "I think the tornadoes helped me to see how God can take anything, even a tragedy and work great things from it. And so I have to see God's hand in it. And that's what we've tried to do." 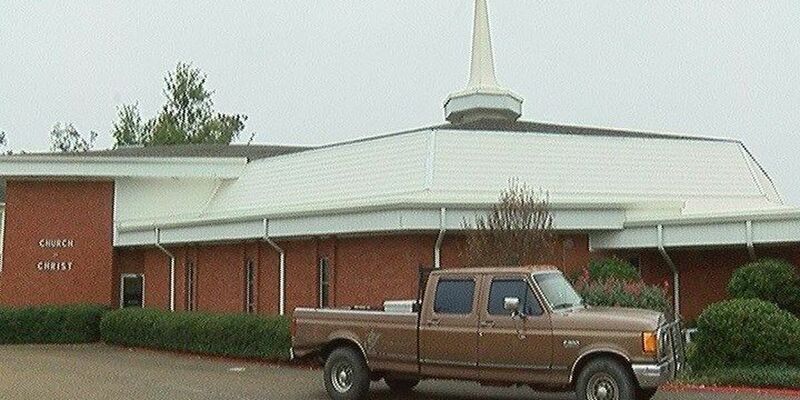 South Main Church of Christ is planning to return Sunday services to the main sanctuary sometime after the first of the year. This Wednesday, church members are showing thanks to their neighbors by helping repair damaged property and clearing debris still in the way after the tornado.